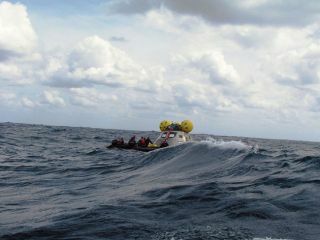 A mock-up of the Orion crew exploration vehicle floats in the open waters of the Atlantic Ocean. NASA engineers are testing this 18,000-pound mock-up to learn what the crews will experience after Orion lands and the recovery teams begin their work. NASA?s newspaceship intended to send astronauts into space and ultimately the moon haspassed an early design review amid uncertainty over whether the rocket slatedto launch it into orbit will ever fly. Thespacecraft, a capsule-basedvehicle called Orion, passed a preliminary review this month to make sure thereare no glaring problems with the design, which NASA plans to replace its agingspace shuttle fleet. Orion capsules are slated to begin operational flights in2015 and, under the current plan, return astronauts to the moon by 2020. ?I?m veryexcited about the design of this spacecraft,? said Jeff Hanley, manager ofNASA?s Constellation program developing Orion and its Ares I rocket booster. ?It?s a very capable spacecraft not just for low-Earth orbit, but also forreturning astronauts to the vicinity of the moon.? The Orionspacecraft is a 16.5-foot (5-meter) wide capsule designed to carry at leastfour astronauts on crew change flights to the International Space Station or onlonger expeditionsto the moon. NASA originally envisioned launching six people aboard Orion,but scaled down the crew size for the first flights earlier this year in order to maintain the 2015 flight schedule. Orion?spreliminary design review, a major project milestone, comes as uncertainlylooms over the spacecraft?s Ares I rocket, a two-stage booster slated to makeits firsttest flight on Oct. 31. Earlierthis month, an independent committee appointed by the White House to reviewNASA?s plans for human space exploration came up with fourgeneral options for consideration by President Barack Obama. Only one ofthose options, a baseline study, included the Ares I rocket while othersreplaced it with existing rockets or NASA?s larger, heavy-lift Ares V boosterplanned to support eventual moon missions. Thecommittee, led by former Lockheed Martin CEO Norman Augustine, is expected tofile a final report to the White House in upcoming weeks. Any presidentialdecision to eliminate the Ares I rocket would add years to Orion?s development,project managers said, but NASA has a wealth of experts that could be ready toreview that option. ?It?simportant for folks to understand that the rocket and the spacecraft fly as anintegrated system,? Hanley said in a Tuesday teleconference. ?So whatever we dowith respect to the launcher, we would have to go back and redo, to someextent, work that is already done.? That couldmean a considerable reevaluation of Orion?s design, adding up to two years toNASA?s already extended development schedule. An independent report released thismonth found that NASA would have to spendbillions more than planned if it abandoned the Ares I rocket and replacedit with an human-rated Delta 4 Heavy rocket currently available for unmannedsatellite launches. ?I thinkwe?re very much staying on the plan right now until we receive new direction,?Hanley said. To date,NASA has spent $3.1 billion developing the Orion spacecraft and $7.7 billion onthe Constellation program as a whole. The agency plans to spend about $35billion on the program through 2015. The Augustine committee has said NASA doesnot have the budget to meet its ultimate target - returning astronauts tothe moon by 2020 - unless it receives a substantial boost from the ObamaAdministration. Currently,the Orion crew capsule is about 300 pounds (136 kg) heavier than its targetweight of about 21,400 pounds (9,706 kg), spacecraft project manager Mark Geyertold reporters. NASA has about 1,000 pounds (453 kg) of margin and expects tohit its weight target soon, he added. Geyer addedthat engineers still have to complete a design review of a critical cover forOrion?s landing parachutes to make sure it is safe and efficient. That is expectedto be completed soon. The finalcritical design review for Orion, the Ares I rocket and other systems are notscheduled until about 2011 or later, when NASA would begin building flighthardware, Hanley added. Once the Augustinecommittee submits its report, the options it compiled will be evaluated by theObama Administration and NASA?s new chief Charles Bolden, a former shuttlecommander. ?We have afew weeks left to wait and see what happens with this review and what directionCharlie Bolden and the team wants to take us,? Hanley said. ?So we wait withgreat anticipation. ?